Scroll and look for your need information. Please contact us, if there is no information which you need. Send us a message or simply request catalogs and documents. We will respond as soon as possible. The LS-700 is a eddycurrent sensor for non-contact displacement and position measurement. It can be used for various uses. Device control, product inspection, and research and development. It is very easy-to-use and has the outstanding temperature stability. 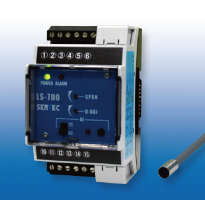 LS-700 can extend a function by adding an external unit.SENTEC can make the sensor head for a special use. 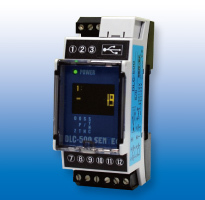 DLC-500 is an extended unit which links with the back connector of LS-700 directly and gives a digital linear function. By using this apparatus, proofreading work on a user side is attained and a merit can be obtained in various applications, such as expansion of a time base range, and change of an output range. - All the operations are easy. - It connects with a personal computer by USB, and can perform a setup of parameter change and linear compensation. - The data logger function by csv format. - A surface terminal is used and sensors other than LS-700 are connectable. The LS-500 is a eddycurrent sensor for non-contact displacement and position measurement. It can be used for various uses. Device control, product inspection, and research and development. It is very easy-to-use and has the outstanding temperature stability. And an analog hold, a low pass filter, etc. can be added. It has been a long seller item since sale. SENTEC can make the sensor head for a special use. The LS-117 is a minimal eddycurrent sensor. -- it is very small size! And it has a function of detection of guidewire malfunction. LS-117 is inexpensive and reliable products. - 8DIP switches to select "sensor head", "synchronus mode"
"output mode" and "off-delay timing"
- automatically detection of guidewire malfunction. TS-500 detects tiny ferrous materials passing through in high speed. 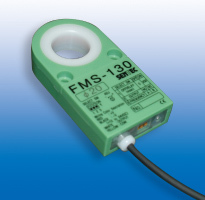 BUILT-IN AMPLIFIER TYPE Metal Pass Sensor "FMS-130"
FS-500 holds the peak(P) and the bottom(B) values to calculate the amplitude(Peak - bottom) providing limit alarm output when the amplitude exceeds the preset value of the distance between the sensor head and vibrating object or turning eccentric shaft, which will change during the movement. The eccentricity detection by chucking error of cutting process bearing. SK-500 detects viration and shock. SK-115 detects viration and shock. - Detection of troubles of a rotating object.